I've been working on a new podcast since the beginning of the year, and I'm thrilled to announce that it is now live. Meet the Seasoned Athlete Podcast, your home for stories, advice, inspiration and motivation from currently competing, high-level athletes from a variety of sports who all share one common bond: they are all over 40 years old. I have spent the last handful of months tracking down and interviewing some incredibly cool and fascinating people people who are all killing into their 40s, 50s, 60s and beyond. I'm talking triathletes, marathon runners, ultra swimmers, ninja warriors, Spartan Racers and more. Some lifelong athletes, and others discovering the love of sport and competition later in life. My goal for this podcast is for you to be motivated, inspired and FIRED UP by the stories shared by these incredible athletes. It is my hope that you will leave each episode with an ever-increasing belief in your own athletic potential and capability - regardless of age. Through these athletes, their lives and their stories, I want you to not believe but to KNOW that age is more than just a number - it is an asset! And that you can absolutely live your best life at any age! 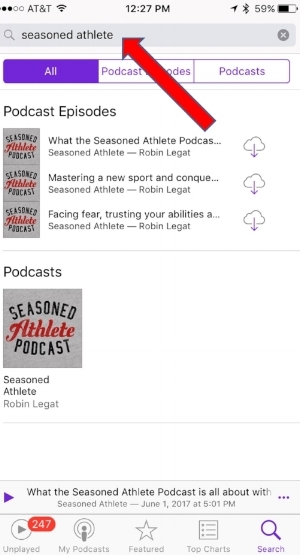 Today, I'm excited to release the first three Seasoned Athlete episodes into the world! In these episodes, you'll get to know 42-year old American Ninja Warrior Selena Laniel, 47-year old Spartan Pro Team member Heather Gollnick - and me! ANNOUNCING - THE BIG PODCAST LAUNCH GIVEAWAY! GIVEAWAY ENDED ON SUNDAY, JUNE 25, 2017. THANKS TO ALL WHO ENTERED! I'd still love for you to listen and leave a rating and review. Read on to find out how to do just that! To celebrate the culmination of months of hard work and on the spot podcasting education, I'm holding good old-fashioned podcast launch giveaway! BONUS FOR EVERYONE WHO ENTERS - You can ask me a question about anything (fitness, nutrition, racing, roller derby, cats - you name it! ), and I'll make a personalized video response and send it directly to you. Details on how to do this will be sent to you after you submit your contest entry! Grand prize winner will be announced when the contest ends on Monday, June 26th! That's pretty soon, so you'll need to act quickly if you want to get in on the giveaway fun! GIVEAWAY ENDED ON SUNDAY, JUNE 25TH, 2017. THANKS TO ALL WHO ENTERED!